Hello again! I hope everyone had a great week! I am a huge fan of breakfast – it really is the most important meal of the day. It literally means to “break” a “fast”. We have been fasting our bodies through the night and now it’s time to enjoy some food! 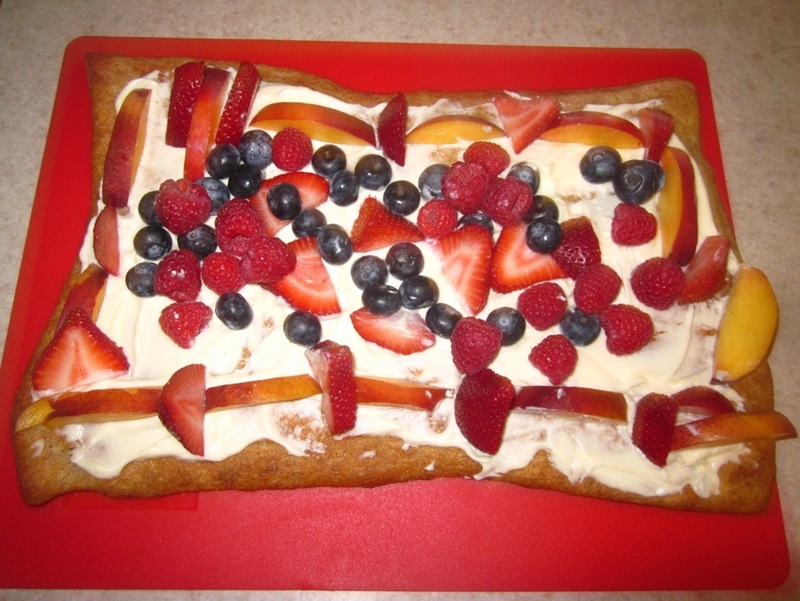 I have a good one for you this week – fruit pizza. It doesn’t have to be for breakfast, truth be told it becomes all three meals when made at our house. It’s a great thing to get the kids involved in. In fact, my 6 year old decorated the one in these pictures. It’s nice to be able to hand them the pizza & a bowl of fruit and say “here, play with your food”! Stone-fruit (fruit that has a pit – peaches, nectarines, apricots, plums, etc.) is coming into season and the berries are everywhere too. Although you can make this with fruit of any season, I have to say this is my favorite one to have. Nectarines are my favorite, then adding in the berries…BOOM! It’s a total food-gasm! This is really easy – a great recipe for all cooks from beginner to master chef. And like most recipes, I have a sub for just about every ingredient. It’s so versatile – change the fruit or flavorings of the topping and you have a whole new dish. And I promise nobody at your table will be complaining! Like I have said before, I am not much of a baker. So I just buy pre-made pizza dough. These days you can find it in pretty much any grocery store. Trader Joe’s has great dough in their deli section. You can also find it in most freezer sections at any grocery store. Whole grain & whole wheat doughs are just about as available as the regular kind. Pick which ever kind you like. Just make sure that you look at the ingredients that went into the dough. Today I went with whole grain dough. And if you are in the mood to make your own from scratch go right ahead (and I applaud your pluck). This is just to keep the dough from sticking to the baking sheet. If you don’t have wax paper, don’t go out & buy some. Aluminum foil works in a pinch. And if you are out of both just serve the pizza right out of the pan you baked it in. Again ALWAYS unsalted no matter what you are making. It helps you control your salt content but also once you get used to using it you will be amazed at how salty the salted butter tastes. For those of you not familiar, mascarpone is Italian cream cheese. It is much smoother than American cream cheese and doesn’t have any of the tanginess. Mascarpone is one of the main ingredients in Tiramisu but it is used in many sweet & savory dishes. It is super creamy and is slightly floral but almost tasteless, making it a blank canvas. It has become a staple in my house because of its versatility. You will definitely see it again in my other recipes. It needs to be room temperature so it will spread easily on the cooled pizza crust. I like to take it out the same time I am preheating my oven to do the crust. You can find it at many grocery stores in the fancier deli area. Trader Joe’s and Costco sell it for the cheapest I have seen. You can sub agave nectar for honey. If you have never tried agave nectar it is like maple syrup without the maple. It’s a natural sweetener and the only one besides honey I have found that actually tastes like sugar not chemicals. This is the amount I use in this recipe for the level of sweetness I like. You can reduce or increase the amount based on how YOU like it. I am using nectarines, raspberries, strawberries and blueberries today. You can use any combination of fruit you like. Dried fruit would even be good. I would shy away from frozen fruit though – it might be too wet and make the pizza soggy. You can bake the crust the night before if you want to try this on a work day. I usually make the crust right when I get up in the morning since my family doesn’t sit down to breakfast for a little over an hour after waking (especially on weekends). I actually tend to do this in little intervals. Wake up, preheat oven. Make coffee, bake the crust. Take shower, complete the recipe. Lay the wax paper on a baking sheet. Press the pizza dough into the desired shape on the paper. If you want to roll out your pizza, just throw some flour on your board and go for it. Me – I am more likely to hit someone over the head with my rolling pin than roll out dough with it. I just press the pizza dough into place. Don’t worry about it being perfect – in fact, I forbid it. I actually prefer the rustic homemade look to the perfectly shaped uniform. Just make sure that the thickness of the dough is about the same all over. If it’s sticky, sprinkle a bit of flour on it and use your hands to help. Brush the melted butter onto dough, lightly and evenly. Using a fork, gently make pricks over the top of the dough. If you don’t have a pastry brush, don’t sweat it. Just drizzle the butter and use the back of a spoon or your fingers to coat the top. The butter will help the crust get golden brown in the oven. The pricks by the fork will help keep those giant bubbles from forming while the crust is baking. Bake at temperature and time according to directions that came with the dough. Allow crust to completely cool after it is baked. Make sure your oven is preheated before you put the dough in to bake. If for some odd reason the directions for baking the crust aren’t clear on the package, a safe guess is to bake for 14 – 20 minutes at 400 degrees. When it’s done, you can pull the wax paper (don’t burn your fingers) with the crust along with it off the baking sheet and it will cool faster. You want it cooled before you spread the topping on because heat will melt the mascarpone and then you’ll have nothing but a big mess. In a bowl, mix mascarpone, honey and vanilla until completely smooth. Spread evenly on cooled pizza crust. Easy peasy right? If the spread is too thick you can thin it out with a little milk – just a drop or two. Then just top with fruit! Thank so much for visiting me this week! I hope you try this and/or any of my recipes. And if mine don’t work for you then find some that do! Just try to do what you can. It’s pretty hard to completely change overnight. If you are just starting out, take baby steps – eventually you will get there. Try just cooking one time a week and increase as you go. And I am always here, happy to help answer any questions you have. Thank you for reading my recipe! I hope you enjoyed it enough to try it! You can access a printable version without the commentary here fruit pizza. If you have questions or comments feel free to email me at bradymunchblog@yahoo.com! For more of my recipes and delightful commentary (ha-ha!) please check out my blog BradyMunch on Word Press!